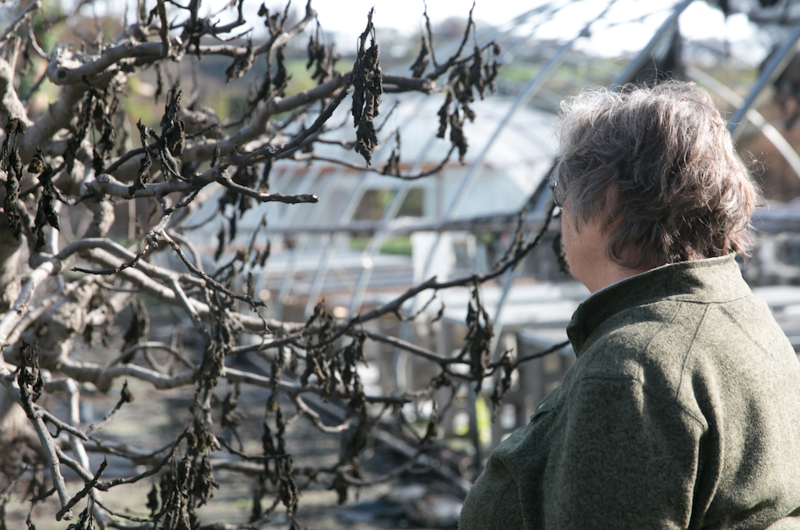 The fire may have destroyed their farms and homes, but these local farmers won’t stop growing food for the rest of us. Thirty years ago, Janet and Corrie Leisen settled in Santa Rosa’s Wikiup Bridgeway subdivision—a small valley tucked among towering oaks and eucalyptus and bordered by Mark West Creek. They raised three children in this rural pocket of town alongside a close-knit community of neighbors. 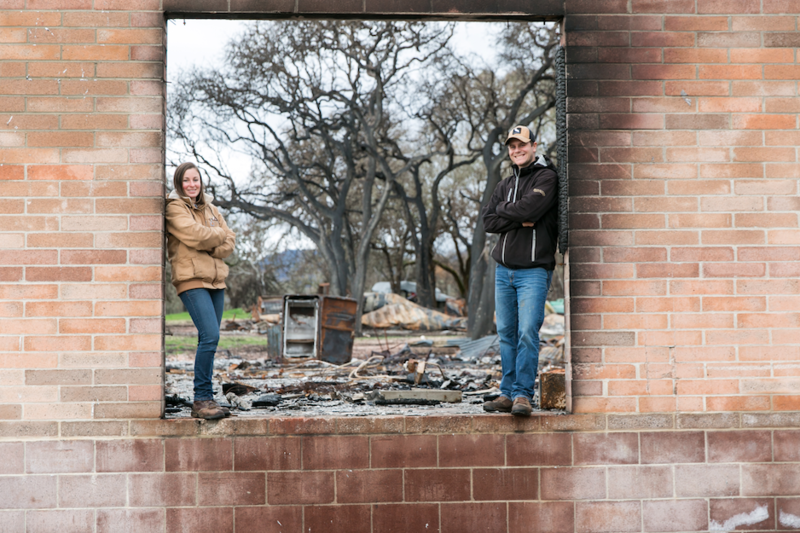 Before the Tubbs fire, the Leisens could walk out their front door and onto their eight-and-a-half acre farm with mixed row crops, hoop houses, 200 chickens and a two-story barn that housed a 1919 Cole Aero Eight automobile, meticulously restored by generations of Corrie’s family. In a matter of hours, the massive wildfire reduced the barn and the car to a pile of ashes and twisted metal, and the Leisen’s home and farm to rubble. The two seasoned farmers are still digging their way out. Leisen’s Bridgeway is one of several small farms that were impacted by the North Bay Fires. In Sonoma Valley, Oak Hill and Bee-Well Farms were hit hard. In Santa Rosa and Larkfield, the list includes What’s Up and Let’s Go Farms. 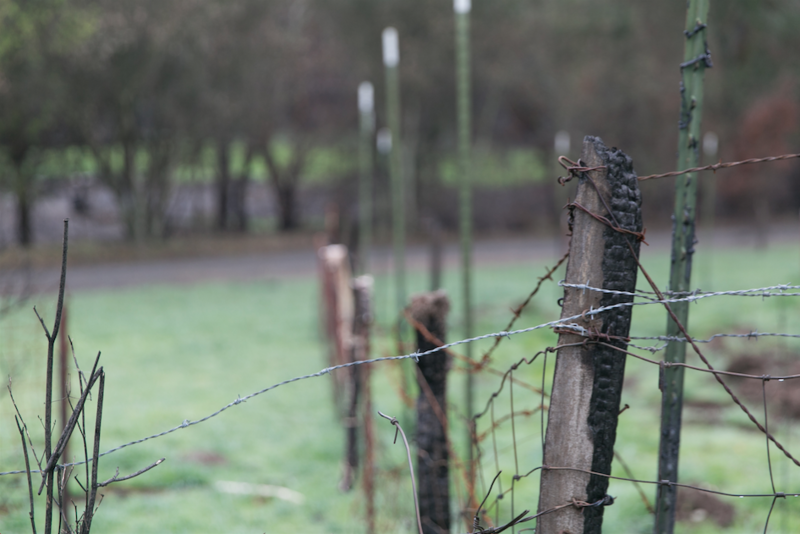 The fire severely damaged the businesses and homes of farmers and threatened these farms’ role in the local food economy. According to a 2011 report by the Sonoma County Food System Alliance, local farms and food manufacturers generate an estimated $1 billion in revenue annually. In addition, local food production increases access to fresh, nutritious food. Here are the stories of three of those essential food producers and how they were impacted by the events of October 2017. Farming was a second career for Janet and Corrie Leisen. They began the venture in 2013 after retiring from dentistry, and the farming operation grew quickly. Within five years, they added a second plot in Rincon Valley, hired three employees, and sold produce, fruit, and eggs to local food distribution hub F.E.E.D. Sonoma, restaurants, and various farmers’ markets. Despite diligently maintaining the defensible space around their Wikiup lot, everything that made vending at those markets possible—tables, canopies, twist-ties—burned up. “We were ready to quit,” says Janet. On a visit to the farm in January, amid the skeletons of hoop houses, melted tarps, and shattered glass, a few green shoots were starting to emerge. Native rose, California grape, mint, yarrow, berries and even rows of kale and chard were coming back. Many of the fig trees survived. 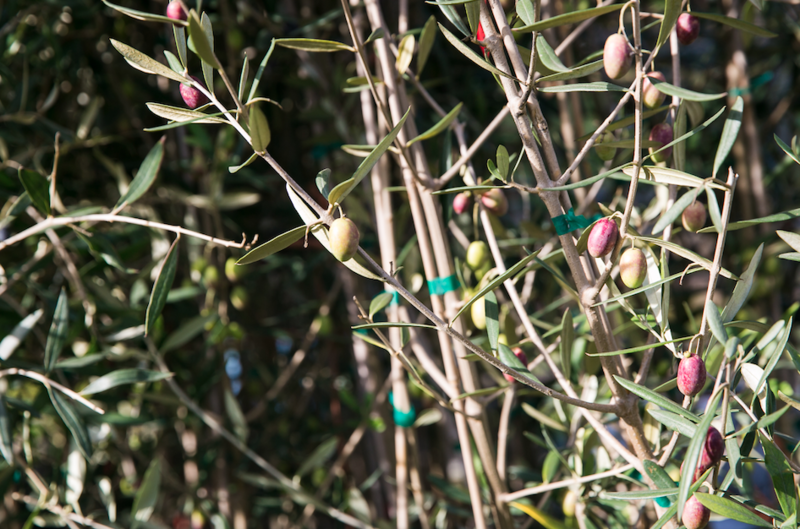 Surprisingly, so did a patch of young olive trees. After the fire, farmer friends donated market supplies, and a coop and electric fence for the surviving chickens. For now, the Leisens will speed up a pre-existing plan to downsize. A senior employee is taking over the lease for the Rincon Valley plot. Once the water and power return at the Wikiup Bridgeway property, the Leisens will narrow their focus to perennials and small plantings of annuals primarily for wholesale distribution. They frequently travel from a temporary home on family land in northwest Santa Rosa to the farm, and they wait for FEMA to clean-up and for the Army Corps of Engineers to rebuild the neighborhood bridge. In the meantime, they’re sorting out irrigation and drainage issues. “I don’t think we can completely stop,” admits Janet, who has been farming in one way or another since she was a kid growing up in Santa Rosa. Smith, owner of Let’s Go Farm and garden coordinator at Santa Rosa Junior College’s Shone Farm. Smith has been farming at his family’s property on Wallace Road in Santa Rosa since 2011. On the night of October 8, he was up late preparing for the week ahead. Neighbors started texting about smoke. Around 11pm, Smith called 911, but the operator didn’t suggest evacuating. An hour later, Smith was in a panic. He let his sheep and pony out into a larger pasture and rallied his mom and a few of their smaller animals. As they ﬂed to a family member’s house in downtown Santa Rosa, they saw ﬂames approaching their house. They weren’t able to get back in until over two weeks later. On returning, they found a burned out home and farm. Smith’s resolve to rebuild is strong. Commuting from his temporary home—a 1990 Alpine Light RV parked in Bennett Valley—Smith is taking the opportunity to rethink things “in a big way.” He’ll continue selling produce through farmers’ markets and a CSA, but he wants to make structural changes—physically and philosophically. “I can build the farm with a blank slate,” says Smith. How the restructure will look is still taking shape, but Smith would like the farm to be more welcoming to the public. He’s making slower, conscious decisions about choices ranging from which perennials to plant to finding the best locations for the refrigerator and bathroom. Like the Leisens, Smith has been buoyed by help from his community. Along with a successful Go Fund Me campaign, he received fire relief funds from the North Bay Just and Resilient Future Fund. But, money isn’t the only way people have helped. In January of this year, Smith introduced community work days at the farm. 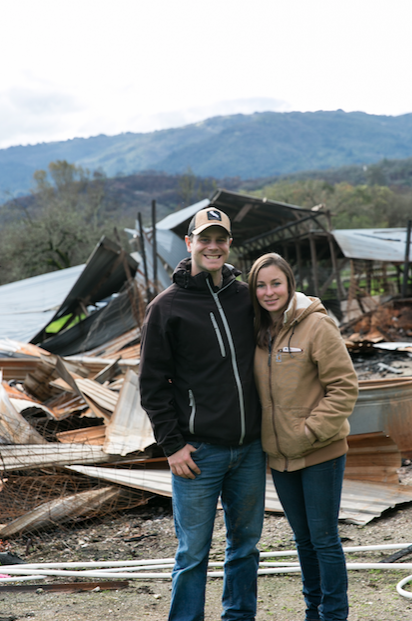 In Glen Ellen, Melissa and Austin Lely of Bee-Well Farms lost their house and their main farm, including grazing land for 12 cows. As they pulled out of their driveway on the night of the fires with only their dog and laptops, they worried about their pregnant cows, two goats, and a ﬂock of 375 chickens, secured in their coop. Somehow, the Lelys were able to get back onto their property the next morning and were relieved to find all of the animals still alive. “Somehow the fire didn’t get high enough or hot enough to burn the chicken coop and the cows just danced around it,” says Melissa. The couple spent the following days patching fences and scrambling around town trying to get food and water to any other animals they could help. The outpouring of support from their community has helped them maintain a positive attitude, says Melissa. They’ve received fire relief funds from the Community Alliance with Family Farmers/The Farmers Guild. Neighbors and Bee-Well customers have offered pasture for the cows, a house to live in and—potentially—new farmland to lease. This isn’t to say it’s been easy. The hardest part, says Melissa, is working out logistics—like how to get the most from their insurance coverage. Their biggest lesson? Update your insurance to reﬂect improvements and new supplies. The Leisens say the same thing. The harsh reality is that insurance doesn’t cover all of the expenses. Even farm insurance doesn’t necessarily reﬂect the needs of a small diversified or specialty operation. For example, the Leisens were offered $4.40 for chickens for which they’d originally paid $5 each. And they’ll receive just $4 for each of their 200 fruit trees that were just beginning to come into production. Another concern shared by some farmers is soil contamination. It’s still unclear whether the fire-related toxin levels in produce are at dangerous levels, and little research has been done in this area. U.C. Davis and U.C. Berkeley are currently conducting soil safety studies, but the results aren’t in.The Leisens, along with Joey Smith, say their customers (and themselves) have chosen to eat produce as long as it looks safe and tastes good. Overall, these farmers have chosen resilience even though that may look different than it did the past. Instead of seeding tomatoes in February, Janet Leisen was figuring out how to rebuild her house. Instead of harvesting pounds of fruit from his orchard this summer, Smith will be nurturing his newly planted blueberries. It’s all in a day’s work. Even the most damaging wildfire in recorded California history can’t stop these hard-working farmers from digging in the soil and producing fresh food for the rest of us.